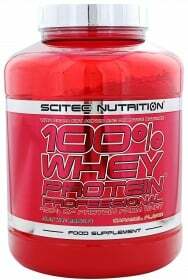 In order to build a professional level physique, you need professional protein support that can only be delivered by Scitec Nutrition 100% Whey Protein Professional! Since you've decided to move up to a higher level of muscle-building, you better leave your regular protein formula behind. What you need is a protein supplement that will keep up with your advanced bodybuilding demands, a protein formula that won't disappoint, one that will just blow you away with its anabolic effectiveness and taste. 100% Whey Protein Professional is the one for you. Low fat, low sugar. Aspartame free! This pro-level protein is made more powerful with the addition of an Amino Acid Matrix composed of L-Leucine, L-Glutamine and Taurine. Each luscious serving of 100% Whey Protein Professional is packed with top grade protein, unbeatable when it comes to absorption and digestion. In which other protein supplement can you find gourmet flavours such as Strawberry White Chocolate, Chocolate Coconut or Honey-Vanilla, just to name a few? All expertly crafted, tested by hundreds of thousands of users, and aspartame-free. 100% Whey Professional guarantees not only the best results in terms of bodybuilding, but also the maximum satisfaction and minimal monotony to your taste buds. Build muscle mass like a pro. 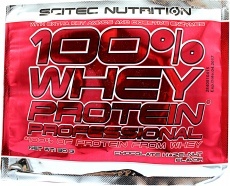 Saturate your muscles with professional - only from Scitec Nutrition 100% Whey Protein Professional! Have a question about 100% Whey Protein Professional? What is it, what does it do, how and when to use or something else? Ask us. 0 out of 1 found this information useful. This brand protein is the best!! Worth every penny! Cappuccino flavour my favourite! I use after workout, mix with milk for best smooth shake! Its my first time to try scitec and i was suprised that the taste is really good and the texture. Not too sweet and with a desent amount of protein per serving . I love it just waitting to finish my order and definitely will try the caramel apple and the chocolate . 100% Whey Protein Professional 1110g 20% FREE ( oportunity ) is a discontinued product. Please browse other products you might be interested in..
Other Ingredients: Chocolate Cookies & Cream: High-quality protein blend exclusively from Whey protein concentrate and Whey protein isolate (containing lactoglobulin, lactoferrin, lactalbumin and immunoglobulin protein fractions), Dextrose, L-Leucine, L-Glutamine, Taurine, digestive enzymes (papain, bromelain), Thickener (Xanthan Gum), Artificial Sweeteners (Acesulfame K, Sucralose), Cocoa Powder (10-12%), Natural and Artificial Flavors (cookies & cream). ALLERGEN INFORMATION: Made from milk. Manufactured in a facility that processes soy and egg proteins, and gluten, peanuts! WARNINGS 100% Whey Protein Professional : Keep out of reach of children. Store in a cool, dry place. As with all exercise and nutrition programs, please consult your physician first. Use this product as a food supplement only.